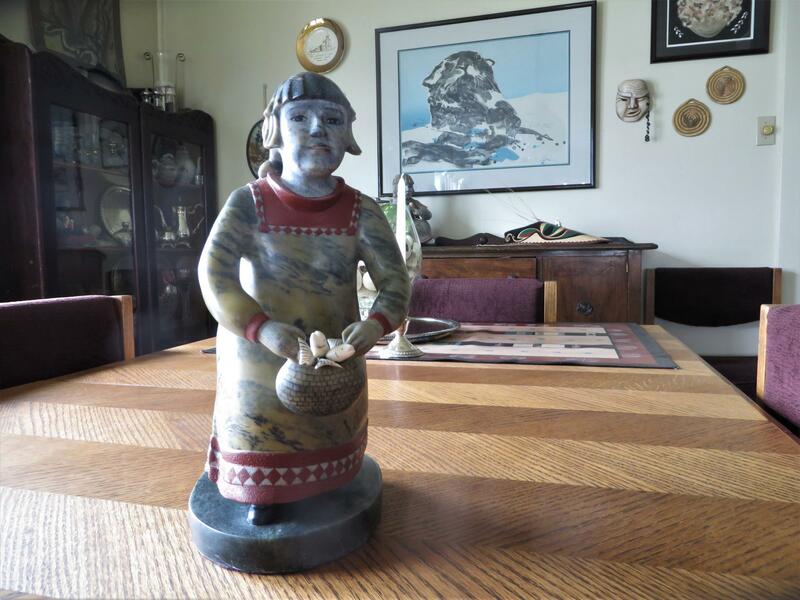 Sculptor Gert Svarny displays her artwork in her Unalaska home. The Rasmuson Foundation has recognized Unalaska’s Gert Svarny as its Distinguished Artist of 2017. The award comes with a $40,000 grant so the 87-year-old sculptor can continue developing her craft. In Gert Svarny’s living room, tucked safely between a cushy armchair and a window looking out on the beach, sits one of her most recent sculptures. Little Feather is a young girl, carved from blue-grey soapstone. She’s wearing a traditional Unangan dress, trimmed with deep red ochre, and her hair is tied back in a long braid. The little girl and her fish are in good company in Svarny’s home, surrounded by all kinds of artwork. Finely woven grass baskets that fit in the palm of your hand. Expressive wooden masks that depict hunters hard at work. 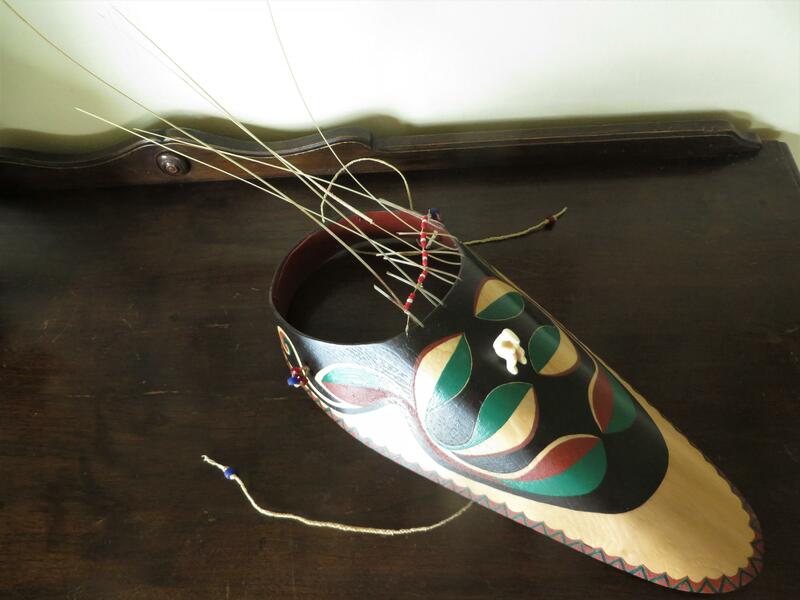 And long-billed visors that celebrate the style of traditional Aleutian kayakers, warding the sun and spray from their eyes. But Svarny hasn’t always translated those thoughts into creative endeavors. She got into art later in life. Art wasn’t on Svarny’s agenda, growing up in Unalaska in the 1930s. She spent her childhood outside, exploring the island with her three brothers and three sisters. “We always tried to get away from mom because she’d make us do chores,” Svarny laughed. Then life changed when she was 12-years-old. It was World War II, and the Unangan people were forced to evacuate their region. Svarny’s family was interned in southeast Alaska. Except for her father, who wasn’t Unangan and had to stay behind. She doesn’t talk much about that part of her life. When Svarny eventually returned to Unalaska, she had a husband and four daughters. They moved into the same house she grew up in. And one day, the art came to her. “I found some bones on the beach and decided to see if I could do anything with them,” Svarny said. Svarny sat at her kitchen table with a melon baller and an X-Acto knife. She’d never taken a class, but she was able to shape one bone into a mask and the other into a small figure. “I just tried it,” Svarny said. More than that,Svarny loved it. She loved handling the materials. She loved bringing her ideas to life. And she loved the way sculpting brightened her mood on a bad day. But that doesn’t mean she felt confident in her work. Not right away. It’s been almost 40 years since she shaped those first pieces of bone, and she’s come to think of herself as a sculptor. All jokes aside, Svarny said she’s found her identity as an artist. Now, she wants to help other Unangan creatives do the same. 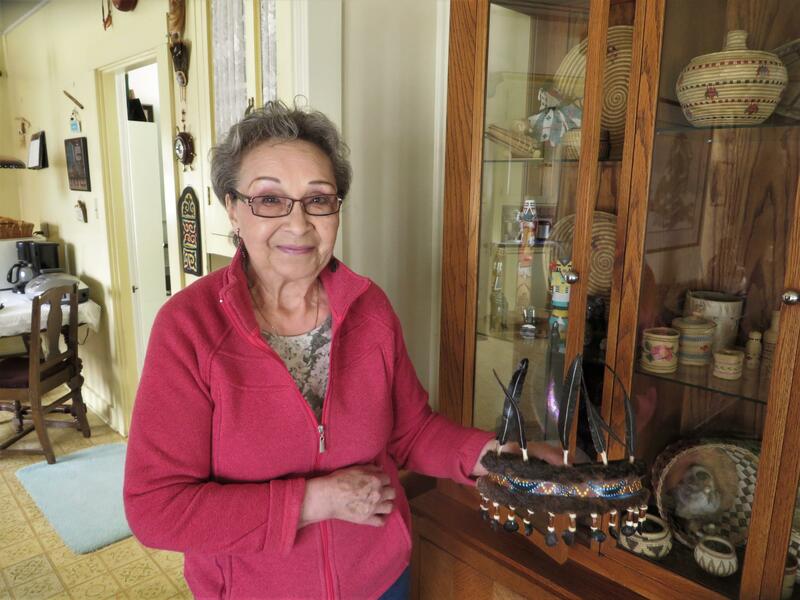 Svarny teaches art to students at Unalaska’s Camp Qungaayux, and she’s brought up her own children and grandchildren with a love for the arts. But she’s not stopping anytime soon. In fact, Svarny said this time in her life may just be the most creative.